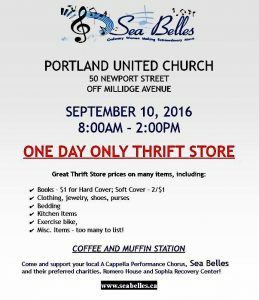 Sea Belles, Saint John’s ladies A Cappella chorus is holding a one day Thrift Store Sale, Saturday September 10th from 8 am to 2 pm at the Portland United Church Hall, 50 Newport Crescent, Saint John. Great Thrift Store prices on many items, including books, clothing, jewellery, shoes, purses, bedding, kitchen items, exercise equipment, etc. A Coffee and Muffin Station is available with periodic entertainment by Sea Belles’ quartets. Proceeds support Sea Belles activities and travel to competitions, with a percentage donated to Romero House and Sophia Recovery Centre.